Automation has a tremendous impact on the enterprise, enabling companies to migrate their legacy database, platforms, and applications to more modern systems faster, with lower costs, and less impact on resources while drastically reducing exposure to risk. 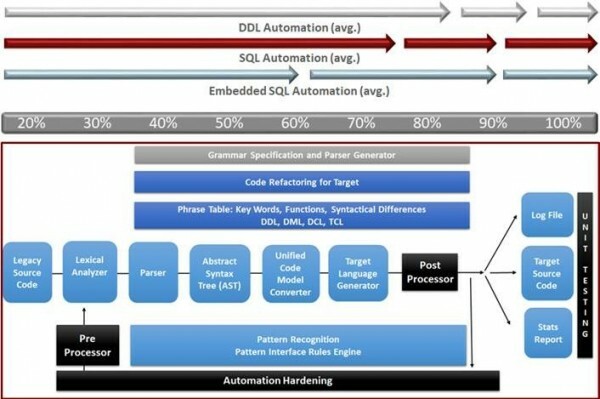 The graph below shows the different levels of automation achieved through MDMS for the various functions of a database migration. The final output to each customer is 100% automation, thereby achieving the required levels of success. The major activities in an automation migration projects are mostly mechanical. Major activities include code conversion, data source conversion, refactoring, re-hosting, quality control, and testing. Analysis: The time to do a manual migration of a legacy system with a million lines of code would require some 28+ man-years of labor to convert. With a team of 10 this takes three years, if done well. With larger systems, one has larger teams. Larger teams require more interactions, slowing the process down further.